In Denmark 98% of glass bottles are refillable and 98% of those are returned by consumers. Set a community, city, state or national goal and then boast the good numbers. Glass collection points, known as Bottle Banks are very common near shopping centres, at civic amenity sites and in local neighborhoods in the United Kingdom. They opened the first one 34 years ago in 1977 and now more than 50,000 Bottle Banks are around the country. Make glass recycling convenient by putting in collection points in more places instead of only relying on curbside programs alone. least 1 euro (60 pence). So the less you throw out, the less you pay and hence the incentive to recycle. You’ll like this: No sticker? Then the trash will be left outside your house to rot. And how well does it work? Take a look at plastic PET bottles which are the most common drinks containers in Switzerland, and 80% of them are recycled – far higher than the European average of 20 to 40%. Include financial incentives that reward people for recycling and reducing waste going into our landfills. Or financial disincentives for those that trash materials that could be easily recycled. Germans, already known for their organization and dedication to the environment, boast that around 90% of Germans are willing to sort out their rubbish and do so. 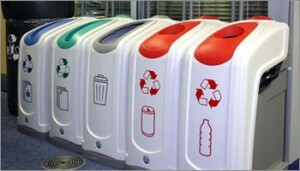 Germany offers color-coded recycle bins for paper, glass, plastic, metals, bio (food waste), packaging and then a black box for materials that cannot be recycled. Good design matters. Use colors and/or shapes to help consumers more easily sort their recycled materials. If people are willing to sort their trash, make it easy for them to do so. Spain targets companies that use glass in their products. Spanish law demands that food and drink companies must pay for the cost of recycling the glass that their products are sold in. This gives a thriving market for private companies to specialize in glass collection, sorting and re-processing. While there are lots of ways to boost consumers to be more environmentally-responsible. Consider financial incentives for companies to source, reclaim and recycle the content they use in packaging their products. What else you think we could do to boost glass recycling in the U.S.?